The transplantation of cadaver tissue might be the next important addition to the armentarium of the reconstructive surgeon. It is. thought that with the help of these so-called Composite Tissue Allografts (CTAs) it will become possible to reconstruct major defects with good functional results [1, 2J. Technically, allografting is feasible and immunosuppressive treatments are available [3, 4J. However, at least one impor­tant problem has yet to be solved before CTAs can become a clinical reality: how to preserve allografts during the prolonged ischemic period between harvesting and transplantation. The studies described in this thesis aimed to lay the foundation for a preservation strategy for isolated skeletal muscle, which is the most sensitive to ischemia of all CTA tissues. For this purpose, the potential of various preservation solutions and storage temperatures to protect rat skeletal muscles during ischemia was assessed. After storage in a solution at 4 °C and 10 °C, the soleus (SOL) muscle and a posteri­or strip of the cutaneus trunci (CT) muscle were allowed to acclimatize in oxygenat­ed KH at room temperature. After acclimatization, various parameters of muscle function were investigated using direct electrical stimulation. In addition, the effect of different storage conditions on the preservation of the morphology (light microscopy) and energy status (HPLC measurements of metabolites) of the muscle was analyzed. In this chapter, the results of the studies are summarized and then dis­cussed. after 8h of storage, hypercontracted and necrotic fibers were seen. In conclusion, the protective effect of 10 °C on muscle was influenced by the storage solution used but not predominantly by the intra- or extracellular-like composition of the solutions. Both UW and HTK were most effective in preserving muscle func­tion (Po > 50% of control). Since depletion of muscle energy stores decreases with decreasing temperatures but increases suddenly at temperatures close to 0 °C [5-6], the effect of cold storage on muscle function was investigated at 4 °C. After 8h of storage in UW or HTK, the function of the CT was still similar to that of the controls, whereas that of the SOL was reduced to 16% and 69 % of control, respectively. Prolongation of the storage time to 16h led to a dramatic decrease in Po in both muscles, although the function of the CT was again better preserved than that of the SOL. For both the SOL and CT, function deteriorated the most after storage in KH. Also, at 4 °C, the threshold stimulus current increased with increasing storage time and was inversely correlated with the reduction of contractile properties. The histo­logical data corresponded well with the functional data in that morphological deteri­oration increased with increasing storage time. Whereas a moderate amount of necrotic and almost no hypercontracted fibers were found in the CT after 16h, in the SOL on average 25% of the cross sectional area consisted of hypercontracted and necrotic fibres. The SOL (type I) and the CT (type lib) differ mainly in fiber-type composition and size. The latter determines the diffusion distance through muscle. In separate experi­ments, the effect of the diffusion distance on muscle preservation was studied by bisecting the SOL, which decreased the original cross-sectional area of the SOL by 50%. No loss of muscle function was found in the bisected SOL after 8h of storage in HTK and UW. Thus it seems that the smaller the size of the muscle, the better its preservation, because of a smaller diffusion distance . In conclusion, the function of the CT, but not that of the SOL, was better preserved at 4 °C than at 10 °C. This differential effect of storage temperature was most likely related to the difference in average diffusion distance between the two muscles. For both muscles, prolongation of the storage time to 16h resulted in a significant decline of function, which could at least be partly attributed to damage to the electri­cal component of the excitation-contraction coupling. Furthermore, at 4 °C, the intracellular-like solutions UW and HTK proved to be superior to the extracellular-like KH for the preservation of skeletal muscles. HTK appeared to be the best preser­vation solution. Conflicting results are reported for the effect of prestorage perfusion on the survival rate of muscle flaps [8-12]. In this study it was investigated whether prestorage per­fusion with either HTK or UW, before immersion and cold storage, improved the preservation of muscle function. A model was designed for in situ perfusion of isolated muscle flaps under physiological pressure conditions. The SOL was perfused as part of the gastrocnemius-soleus flap using the femoral artery, while the posterior strip of the CT was perfused as part of the much larger CT flap using the brachial artery. With the help of a Araldite F® dye study, it was confirmed that the whole vascular system of the SOL and CT strip was perfused. The perfusion model was vali­dated by the demonstration that the muscles could be perfused adequately with donor blood and UW or HTK at a flow rate of 0.2 ml. minr'g-1 muscle for 10 min at room temperature without any adverse effect on muscle weight, function, and morphology. Prestorage perfusion followed by immersion in a preservation solution was compared with immersion without prestorage perfusion. It was clearly demonstrated that, at 4 °C, the muscle function (Po) and cytoarchitecture of perfused muscles was not bet­ter preserved than that of non-perfused muscles, irrespective of the storage time (8h or 16h) and solution used (UW and HTK). The most likely explanation for this lack of efficacy of prestorage perfusion on muscle preservation is that, at 4 °C, compo­nents of the solution do not pass the vascular wall and thus can not provide addi­tional protection to muscle fibers. The results of previous studies (chapter 3 and 4) revealed that storage in a solution (HTK) at 4 °C for 16h reduced the function (P()) of muscles to about 3 0% of control muscles. In addition, for the SOL about 30%, and for the CT about 5-10% of the fibers were hypercontracted or necrotic. The limited long-term preservation of isolat­ed skeletal muscle was hypothesized to be due to increased intracellular calcium lev­els, the occurrence of hypercontraction and oxidative stress. In this chapter, the fol­lowing three interventions were assessed for their ability to improve muscle preservation at 4 °C: 1) oxygenation of HTK, with the aim to maintain ATP synthesis by aerobic metabolism during cold storage; 2) addition of butanedione monoxime (BDM), which inhibits both calcium release from the sarcoplasmic reticulum and contraction of muscle fibers; and 3) addition of antioxidants, such as N-tert-butyl-CC-phenylnitrone (PBN; a OH* scavenger), desferoxamine mesylate (desferal) and deferione (both iron chelators) and trolox (inhibitor of lipid peroxidation), which were expected to reduce oxidant-induced damage. Oxygenation improved the muscle function of the SOL only (PQ: 83%). This muscle mainly contains oxidative fibers. Of all substances used, BDM (10 mM) provided the best protection (P0 : 84% and 60% for SOL and CT, respectively). Different effects on muscle preservation were found for the different antioxidants used: the function of both muscles was improved by 1 mM trolox (Pn ~ 50% of control) and by 3 mM (SOL) or 0.03 mM (CT) deferionc (P(): 55%), but not by PBN and desferal. Combinations of BDM-trolox and BDM-deferione did not further improve the preser­vation of SOL function significantly. As expected, an improved preservation of mus­cle function was accompanied by a reduced increase in twitch threshold current. Therefore, it is most likely that the interventions had a protective effect on sarcolem-mal integrity. Corresponding with the improved preservation of muscle function, oxygenation of HTK and the addition of BDM greatly improved the preservation of the cytoarchitec-lure of the SOL. Moreover, under these conditions almost no necrotic and hypercon-tracted fibers were found after 16h of storage. In contrast, the beneficial effect of the antioxidants on the preservation of SOL function was not accompanied by improve­ment of the preservation of the cytoarchitecture: a large number of necrotic and hypercontracted fibers were still found in the core of the SOL. It is possible that the antioxidants improved the preservation of the fibers in the outer layers of the mus­cle, because an improved preservation of muscle function and threshold current was found. In general, the morphology of the CT was better preserved than that of the SOL. Oxygenation and application of BDM greatly improved the preservation of the morphology of the CT: no signs of deterioration were found. Also, the beneficial effect of the antioxidants trolox and deferione on CT function was reflected by a decreased number of necrotic fibers. ly, after 16h of storage at 4 °C, both the energy profile and morphology of the SOL were the same as those of freshly prepared muscles and only a slight reduction of muscle function was found. Therefore, BDM may have great potential in future preservation strategies for CTAs. Grote weefseldefecten kunnen ontstaan door het verwijderen van tumoren, en bij verbrandingen, traumatische verwondingen of aangeboren afwijkingen. Deze defec­ten worden tegenwoordig routinematig gereconstrueerd middels gesteelde of vrij gevasculariseerde lappen, afkomstig van de patiënt zelf, of middels het replanteren van geamputeerde vingers of ledematen. Het overlevingspercentage van deze zoge­naamde "autografts" is erg hoog. De functie van de gereconstrueerde delen is echter vaak beperkt omdat hel verwijderde weefsel zelden door identiek weefsel kan wor­den vervangen. Daarnaast kunnen complicaties optreden op de plaats waar de lap is gecreëerd ("donor-site morbidity"). Een oplossing voor deze problemen zou het gebruik van kadaverweefsel kunnen zijn, middels zogenaamde Composite Tissue Allografts (CTA's), welke kunnen zijn samengesteld uit een combinatie van huid, spieren, bot, vet, kraakbeen, zenuwen of bloedvaten. Het verwijderde weefsel kan dan daadwerkelijk worden vervangen door identiek weefsel en er hoeft geen extra defect te worden gecreëerd bij de patiënt. In experimenteel onderzoek is aangetoond dat "allografting" chirurgisch-technisch mogelijk is en dat de benodigde immuno-suppressieve behandelingen voorhanden zijn. Onbekend is echter hoe deze samengestelde transplantaten buiten het lichaam bewaard zouden moeten worden tijdens de zogenaamde ischemische periode. Voordat CTA's klinisch gebruikt kunnen worden dient een bewaarstrategie ontwor­pen te worden die voorkomt dat de functie van een transplantaat gedurende de ischemische periode achteruit gaat. In dit proefschrift is getracht een eerste aanzet te leveren voor het ontwerpen van bewaarstrategieën voor dwarsgestreept spierweefsel, omdat van alle CTA weefsels, de spieren het meest gevoeligst zijn voor ischemie. Het doel was te achterhalen in welke bewaarvloeistof en bij welke bewaartemperatuur dwarsgestreept spierweefsel het best kan worden bewaard gedurende de ischemische periode. Hiertoe werden twee ver­schillende spieren (de soleus (SOL) en een strip van de cutaneus trunci (CT)) van de rat geïsoleerd en gedurende maximaal 16 uur bewaard in een bewaarvloeistof bij lage temperaturen. Vervolgens werden de spieren gedurende 90 minuten geacclimati­seerd op kamertemperatuur in een fysiologische vloeistof (Krebs-Henseleit, KH) die werd doorborreld met carbogeen (95% O2 en 5% CO2). Na acclimatisatie werd de spierfunctie in vitro bepaald door met directe elektrische stimulatie bij 2 1 °C spiercon­tracties op te wekken, met als belangrijkste gemeten parameter de maximale tetanus. Tijdens de maximale tetanus ontwikkelt de spier zijn maximale kracht, die wordt afgekort met PQ. Tevens werd het effect van de verschillende bewaarstrategieën op de morfologie (middels licht-microscopisch onderzoek) en energiehuishouding (middels HPLC metingen van metabolieten) van de spier geanalyseerd. Onderstaand zijn de resulta­ten van deze studie samengevat. De capaciteit van verschillende bewaarvloeistoffen om spieren te beschermen gedu­rende 2, 4 of 8 uur bewaring op 10 °C wordt beschreven. In het algemeen bleek dat de spierfunctie meer afnam naarmate de spieren langer werden bewaard. Eveneens bleek de drempelwaarde van de stroom, d.w.z. de stroom die minimaal nodig is om een waarneembare contractie te verkrijgen, toenam met langere bewaartijd. In over­eenstemming met de functie werd gevonden dat de morfologische beschadigingen in toenemende mate voorkwamen na langere bewaartijden. Na 8 uur bewaring werden hypergecontraheerde en necrotische vezels gevonden. Geconcludeerd is dat het type bewaarvloeistof invloed heeft op de conditie van de spieren bij 10 °C. De intra- versus extracellulair samenstelling van de bewaarvloeistof speelde hierbij echter een ondergeschikte rol. Zowel UW als HTK bleken effectieve bewaarvloeistoffen voor spieren te zijn (Po > .50 % van de controle spieren). Daar energiemetabolisme en dus verzuring van spiercellen in toenemende mate afne­men bij verlaging van de temperatuur, zou spierweefsel het best bewaard worden bij een zo laag mogelijke temperatuur. Voor spierweefsel is echter ook aangetoond dat het metabolisme na een aanvankelijk daling weer toeneemt bij temperaturen dicht bij 0 °C. Daarom is het effect van bewaring bij 4 °C op het behoud van spierfunctie geëvalueerd en uiteindelijk vergeleken met dat bij 10 °C. De functie van de CT was na 8 uur bewaring bij 4 °C in UW of HTK gelijk aan die van de controle spieren, terwijl de functie van de SOL was afgenomen tol respectie­velijk 16% en 69% van controle. Verlenging van de bewaartijd tot 16 uur vcroorza-kte een groot functieverlies voor beide spieren, zij het dat de functie van de CT wederom beter werd behouden dan die van de SOL. Het grootste verlies aan spier­functie werd gezien na bewaring in KH. Ook werd de drempelwaarde van de stroom in toenemende mate hoger met verlenging van de bewaartijd. De histologische bevindingen stemden goed overeen met de functie bevindingen. De morfologie van de CT was zeer goed gepreserveerd bij 4 °C en na 16 uur werden slechts enkele necrotische vezels en nauwelijks hypergecontraheerde vezels gevonden. In de SOL daarentegen vertoonden na 16 uur 25% van de vezels necrotische en hypergecontra­heerde kenmerken. dat er na 8 uur bewaring in HTK en UW geen verlies van functie optrad voor de gehalveerde SOL. Geconcludeerd werd dat de functie van de CT, maar niet die van de SOL, beter werd gepreserveerd bij 4 °C dan bij 10 °C. Dit verschil in effect van bewaartemperatuur kan hoogstwaarschijnlijk worden toegeschreven aan het verschil tussen beide spieren in diffusie-afstand. Voor beide spieren werd een groot functicverlies waargenomen na 16 uur bewaring, dat tenminste voor een deel werd veroorzaakt door beschadi­ging van de electrische component van het excitatie-contractie mechanisme. Tot slot, de intracellulaire vloeistoffen (UW en HTK) toonden bij 4 °C een betere preservatie dan de extracellulaire vloeistof KH en bewaring in HTK was het meest effectief. Voorafgaande aan orgaantransplantaties is het gebruikelijk het vaatbed van organen door te spoelen (perfunderen) met een bewaarvloeistof alvorens de organen bij een lage temperatuur te bewaren. Voor het behoud van de functie van de spiercellen tij­dens de bewaring van "allografts" is het nut van deze zogenaamde "prestorage per-fusion" echter niet duidelijk omdat tegenstrijdige resultaten worden vermeld in de literatuur. 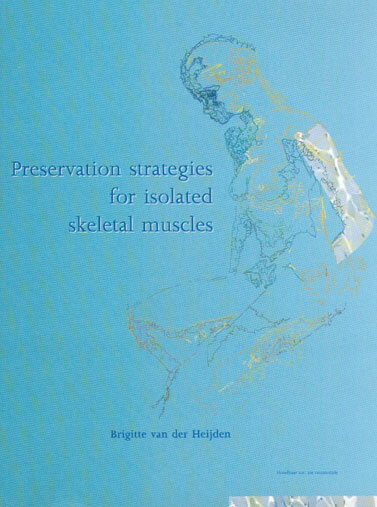 Derhalve is het effect van "prestorage perfusion" met UW of HTK op de bewaring van spieren onderzocht. Allereerst is een model ontworpen om het vaatbed van geïsoleerde spierlappen onder fysiologische condities te perfunderen. De SOL werd samen met de gastrocnemius spier geïsoleerd (gastrocnemius-soleus lap) en geperfundeerd via de arteria femoralis. De achterste strip van de CT werd, als onder­deel van de veel grotere CT-flap, geperfundeerd via de arteria brachialis. Door een kleurstof (Araldyte F®) werd geverifieerd dat op deze wijze inderdaad het volledige vaatbed van zowel de SOL als de CT-strip werd geperfundeerd. Het perfusie model werd gevalideerd door aan te tonen dat beide spieren bij een perfusiesnelheid van 0.2 ml.minr'g"1 bij kamertemperatuur adequaat konden worden geperfundeerd met zowel bloed, UW en HTK zonder dat dat leidde tot veranderingen in functie, morfo­logie of gewicht van de spieren. In deze studie werd het effect van "prestorage perfusie" bij kamertemperatuur, gevolgd door bewaring in een bewaarvloeistof bij 4 °C, vergeleken met het effect van bewaring in een bewaarvloeistof bij 4 °C zonder voorafgaande perfusie. De vorige hoofdstukken uit dit proefschrift lieten zien dat de spierfunctie na 16 uur bewaring in een bewaarvloeistof (HTK) op 4 °C was gereduceerd tot ongeveer 30% van de controle. Tevens bleek dat ongeveer 30% van SOL vezels en 5-10% van de CT vezels hypergecontraheerd of necrotisch waren. Onze hypothese is dat een verhoogde intracellulaire calcium-concentratie, het optreden van hypercontractie, of schade ver­oorzaakt door oxidanten debet waren aan het beperkte functiebehoud van de geïso­leerde spieren. Op basis van deze veronderstelling is het effect van de volgende drie interventies op de bewaring van spieren geanalyseerd: 1) oxygeneren van HTK, met als doel de ATP synthese via de aërobe stofwisseling te handhaven; 2) toevoegen van butanedione monoxime (BDM), om de stijging van de intracellulaire calcium-con­centratie te beperken en de vorming van gehypercontraheerde vezels te voorkomen en 3) toevoegen van antioxidanten, zoals N-tert-butyl-a-phenylnitrone (PBN: een hydroxyl-scavenger), desferal en dcferione (beide ijzer-chelatoren) en trolox (een lipid-peroxidatie remmer). Oxygeneren van HTK bleek alleen heilzaam voor de SOL (Po: 83% van controle), een spier die voornamelijk uit type I vezels bestaat, die voor hun energiehuishouding afhankelijk zijn van het aërobe metabolisme. Van alle stoffen bood BDM de meeste bescherming (PQ: 84% en 60% voor de SOL en CT, resp). De effectiviteit van de ver­schillende antioxidanten verschilde sterk: de functie van beide spieren werd beter gepreserveerd na toevoegen van 1 mM trolox (Po ( 50% van controle) en 3 mM (SOL) of 0.03 mM (CT) dcferione (P0:55%), terwijl na toevoegen van PBN en desfe­ral de spierfunctie niet beter werd gepreserveerd. De combinaties BDM-trolox en BDM-deferione resulteerden niet in een verdere verbetering van de preservatie. Omdat een beter behoud van de spierfunctie altijd gepaard ging met een verminder­de stijging van de drempelwaarde van de stroom, lijkt het zeer waarschijnlijk dat de interventies een beschermend effect hadden op de integriteit van de spiercelmem-braan. van de morfologie. Na 16 uur werden zelfs nauwelijks necrotische and hypergecon-traheerde vezels gevonden. Daarentegen ging het gunstige effect van de antioxidanten op de spierfunctie niet samen met een verbeterde morfologie: in de kern van de SOL werd nog steeds een grote hoeveelheid necrotische en hypergecontraheerde vezels aangetroffen. De verbeterde bewaring van de.functie en drempelwaarde van de stroom wijzen er echter op dat de vezels in de buitenste lagen wel degelijk beter waren bewaard. Zoals in voorafgaande hoofdstukken, was de morfologie van de CT in het algemeen beter behouden dan die van de SOL. Een spectaculaire verbetering van de morfologie werd gezien na oxygenatie van HTK en toevoegen van BDM: geen enkel teken van beschadiging werd aangetroffen. Toevoegen van antioxidanten (defe-rione en trolox) resulteerde in een verlaging van het aantal necrotische vezels. De biochemische resultaten kwamen goed overeen met de functie bevindingen. Spieren met het beste behoud van functie vertoonden ook het beste behoud van de energiehuishouding. De metabole achteruitgang die kenmerkend was voor de SOL na 16 uur bewaring in HTK bestond uit een verminderde concentratie van hoge-energie metabolieten (ATP en PCr), toename van afbraakprodukten (IMP en inosine) en een afgenomen ATP/ADP ratio, wijzend op een verminderde mitochondriële functie. Daarentegen bleek dat de energiehuishouding van de spieren behorend tot de oxyge­natie- en BDM-groep gelijk was aan die van de controle spieren. Samenvattend kan worden geconcludeerd dat de functie, stofwisseling en morfologie van zowel de SOL als de CT significant kan worden verbeterd door toevoegen van BDM, trolox of deferione aan de bewaarvloeistof. De effectiviteit van deze stoffen kan ten minste voor een deel worden toegeschreven aan de bescherming van structuren zoals de spiercel membraan. Van alle stoffen die getest zijn, gaf BDM de beste preservatie. Noemenswaardig is de vondst dat na 16 uur bewaring bij 4 °C zowel de energiehuishouding als de morfo­logie van de SOL gelijk was aan die van de controle, terwijl slechts een gering verlies aan spierfunctie werd waargenomen. Op basis van deze resultaten lijkt toevoeging van BDM aan de bewaarvloeistof HTK een veelbelovende mogelijkheid voor het ont­werpen van bewaarstrategieën voor CTA's in de nabije toekomst.